Another bout of overnight travelling on a bus - from Hué to Hanoi - once again took its toll on me. After the last time, when I'd managed to get very little sleep on account of the very noisy people on the bus, I was determined to do better this time around; also, there seemed to be fewer noisy types at the back. Things looked promising, and I did my utmost to get a full evening's sleep as the bus made its way through the dark Vietnamese night. I kept myself awake until midnight, as planned, listening to music while all around me had dropped off. The plan was to make myself so tired, and so bored of looking out of the windows into pitch black nothingness that by midnight I could switch off the music and fall into a slumber. It didn't quite go according to plan. The first thing to say about the tour buses is that they seem to be built with small people - like Vietnamese people, for example - in mind. My head was always hanging too far off the back of the 'head rest', putting a rather uncomfortable kink in my neck. No position was comfortable. The seats were also very narrow, so it wasn't possible to sit at an angle and stretch out more. And so it was that I listened to another album, watched the clock go past 12:30, 1am, listened to another album, watched the minutes tick by even more and so on until somewhere around 4:30am. At that point I think I managed to get some sleep. Given that we were due to arrive in Hanoi at 6am, this wasn't good. As before, as soon as we got to the hotel, we both zonked out, not waking until after midday. So, the lesson is this - cheap buses that run overnight might save you money, but won't necessarily save you time. For me, sleep has been nigh on impossible in those seats, so next time I might think about going by train in a sleeper cabin instead! With yesterday pretty much written off, I didn't do much other than traipse around the streets, checking out all the tours that were on offer. Like many other towns and cities in Vietnam, there are areas where almost every shop on the street is a tour ticket agent. You'd think that this might offer some variety, but in reality, out of 20 shops, the tours might only be spread between 3 different operators. They all want your money, though, and they'll tell you anything you want to hear. After our 'taxi service' tour around Hué, we wanted to hear that entry fees were included. Thankfully, everyone seemed to be saying this was the case. After much deliberation, I picked a city tour and a 2-day trip to Halong Bay and kept my fingers crossed. Being the first time I'd wandered around the streets of Hanoi's Old Quarter, I noticed some differences between here and other towns in the country. Like everywhere else, the motorbike is king, but with such narrow streets all rules about driving on the right hand side appear to be null and void - it's a total free-for-all. In addition, I noticed that pavements, usually something that pedestrians would use to keep out of harm's way, had another use - motorbike parking. On every street, motorbikes clogged up the pavements making them all but useless for walking along. Evidently the authorities had tried to do something about this - there were white dashed lines along the pavement that suggested parking on one side (near the road) and keep clear on the other. Of course, this was universally ignored. In the clear spaces is where you'd find the street vendors, families sitting on tables and chairs eating, people carrying out bike repairs, welding or some other similar task. So, the only way to get around on foot in Hanoi is to get out into the street and brave the traffic. It's crazy how you can become so blasé about walking across the street with so many bikes coming towards you from different directions, but somehow it works - everyone avoids you! Today, then, we were all set to go around the city. As we checked out of the hotel, the girl working on reception seemed put out that we were not staying more than one night, and didn't seem to buy our excuse that we would be 'staying with friends' (a somewhat euphemistic way of saying that the sheets were dirty, the room cramped and tatty). I can only presume that's why the $10 room suddenly became $11 (a VAT charge - first time we'd been asked in Vietnam) - hardly a massive increase, but irritating nonetheless. It's an example of how people can, and will, scam you out of a little bit here, a little bit there in Vietnam if they can get away with it. We waited outside the hotel room, having already carted our luggage to our next hotel down the road, then waited for twenty minutes for the bus to pick us up. I was starting to wonder if they'd forgotten about us when our guide for the day appeared. On a motorbike. Heck, was this our first surprise of the day - we'd be doing the tour on a bike now? It turned out that he was just coming to usher us over to the minibus. For whatever reason, they didn't come to us, but then once we were on board, they carried on around the cramped streets picking everyone else up. Strange. 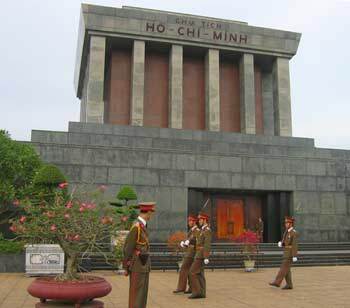 We soon found ourselves at stop number one - the Ho Chi Minh Mausoleum. I was very surprised at just how many people were here. We'd exchanged the manic flow of motorbikes for an even more manic throng of people, mostly tourists from abroad being guided round a set route. We didn't get to see 'Uncle Ho' in his sarcophagus - his old carcass was in Russia being given its annual embalming - but walked around the complex seeing where he used to live, then where he lived after realising that the palace building was a little too showy for someone supposed to be a man of the people, and then where he used to scarper when the American B52 bombers were flattening large areas of Hanoi - his bomb shelter. We met a guy named Scott who had just set out on his travels around the world having quit his job. He was just a few days into a 1-and-a-half year trip, the route almost identical to ours but in reverse (he hadn't planned to go to New Zealand, so we strongly recommended adding that in to the mix - wouldn't have missed that part!). Guards parading past Ho Chi Minh Mausoleum. Our group shuffled along the pathways, hemmed in by the hundreds of other tourists that were here, and on to 1-Pillar Pagoda. This was not the original pagoda which stood higher than the one before us - the French decided to blow it up just before they vacated Hanoi. I dunno, bad losers, eh? 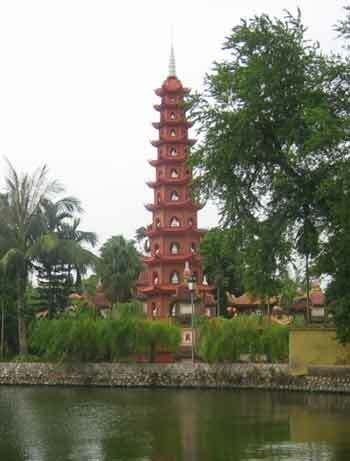 Our next stop was Tran Quoc Pagoda. Our guide, Tung, told us that it was the oldest in Vietnam, but as far as I could tell those bricks it was made of were fresh out of a kiln only days ago! Restoration, no doubt. Either that or I was looking in the wrong direction. Then, once more, we were whisked away to another location for more enlightenment, this time all things ethnic. We visited the Museum of Ethnology, a title that sounded like it had been made up if I ever heard one! It reminded me of the Tribal Museum we had visited in Chiang Mai, Thailand, only much better equipped, much bigger and with more interesting artefacts and displays. Nonetheless, both Manda and I were a little bored with all the information about the various hill tribes and ethnic groups in Vietnam. Been there, didn't buy a t-shirt but did buy a book. Besides, we were looking forward to lunch. The surprisingly well-kept (for its age) Tran Quoc Pagoda. We were not the only ones looking forward to lunch - so, too, were a group of Malaysian Chinese girls on our group who we ended up sitting with. Manda got a chance to speak a little Cantonese with them, but it didn't last long - not all of their group spoke it, so they didn't carry on at the the risk of excluding anyone. They were a nice bunch of people whom we might bump into when we get to Malaysia (two of them offered to meet up, maybe show us around a little in Kuala Lumpur or Penang - very nice seeing as our acquaintance with them went as far back as the amount of time it takes to eat a plate of noodles!). The day we were visiting was also the day that high school students were having some kind of graduation ceremony. This presented a perfect photo opportunity - for ages I'd wanted to get a good photo of a Vietnamese girl wearing the traditional 'au dais' dress but don't like to make it obvious. Here, though, all the girls were wearing their finest au dais for the special day, so we couldn't really go wrong - point the camera in any direction and there you go. Manda managed to catch a great photo as the group moved on through a courtyard entrance (moments before losing me for ten minutes - I had lagged behind and totally lost sight of everyone). 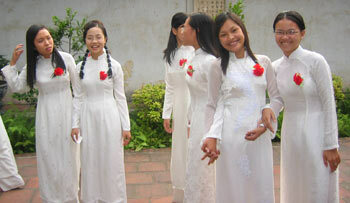 Vietnamese high school girls wearing the traditional 'au dais' dress. I still want to catch what I think is the quintessential Vietnam picture - a Vietnamese girl in white au dais, riding a bicycle with the dress trailing out behind, preferably with a few palm trees and a suitably worn-out looking bridge over a river. I'm not being too picky, am I?! Finally the group made its way to the Ngoc Son Temple which sits on a little island in the middle of Hoan Kiem lake, right in the centre of Hanoi. What can I say? More shrines, more burning incense. Maybe we were getting all templed out. So, we'd had a good tour, even if we hadn't really paid too much attention to the guide (who was excellent). We'd met a good bunch of people, the food had been good but my suspicion that things might not go according to plan were correct. When I'd booked the tour, I did so on the understanding that it included a 1-hour cyclo tour around the streets of the Old Quarter. This never happened. Once again, the itinerary advertised and what actually materialised were very different. This time, though, I wasn't prepared to let it lie and went back to the company to have a moan about it. I managed to get a refund of $4 for the both of us. Yeah, I know. It sounds petty doesn't it? $4 can go quite a way in Vietnam, though, and I was a little fed up with being taken for a ride. Which was ironic, really, because that's precisely what I wanted them to do today - take us for a ride on a cyclo.